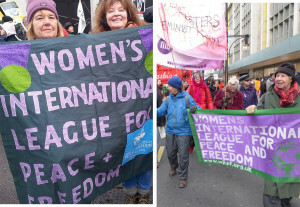 Inspired by the booklet ‘Opposing War Courage and Conscience’ produced by WILPF, Quakers, the Fellowship of Reconciliation, the Peace Pledge Union and Pax Christi, we in of WILPF Sheffield branch asked Sheffield Quakers to join us for an event marking Conscientious Objectors Day in May. We were then asked to submit our event for the annual Sheffield literary festival ‘Off the Shelf’ and it was accepted. We adapted the performance, which took place on Thursday 16 October, under the title Opposing War: Courage and Conscience. There were songs, a poem and readings, some by family members, about local conscientious objectors and others who opposed both World Wars. Excerpts from Vaughan Williams’ evocative Pastoral Symphony were played between each reading and photos of the those commemorated were shown on the screen. The evening ended on a positive note as we heard about the UN Human Rights Council’s resolution, recognizing the legitimacy of conscientious objection, and passed in 2013. The event was a big success with a good attendance and lots of interest in our various stalls and many congratulations.